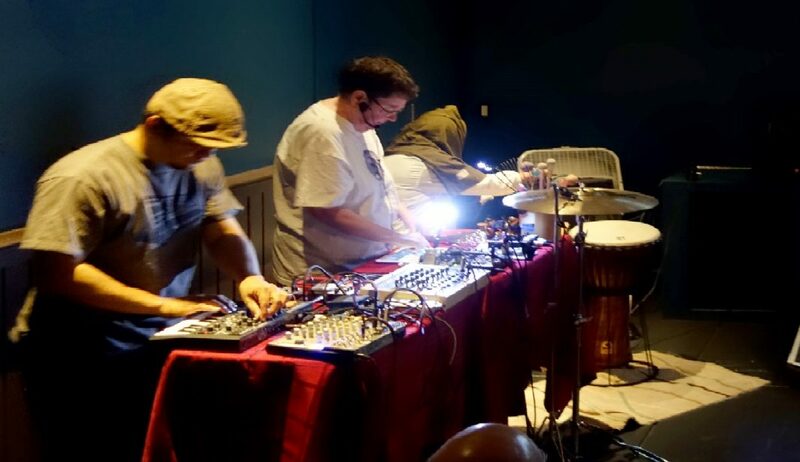 Electro Acoustic Noise – Mark Pino, Ann O'Rourke, Carlos Jennings!! Mark and Carlos – more info!! Reprinted with permission of Mark Pino, aka Disaster Amnesiac, percussionist in Ear Spray (and other groups), from his blog posting dated 8/3/13 at http://disasteramnesiac.blogspot.com/ He is in the Ear Spray photo above. Disaster Amnesiac feels certain that last night’s concert at the Mission District’s venerable Victoria Theater will go down as a high point for live music in the Bay Area for 2013. Waiting in line for admission, I felt a great, freaky vibe emanating from the hundreds of music fans and Mission street people. Thankfully, the vibes were realized inside, despite lengthy delays in getting everyone seated and starting the music. Owing to that delay, Disaster Amnesiac felt a bit inhibited as regards taking photos of the first two groups. Let me say this: Hans Grusel’s Krankenkabinet performed a great piece for strings and electronics, in which a Power Electronics blast was paired with Black Metal vocalizing and really neat costumes and props (Grux?). Their sounds gave this listener a nicely powered lift. sfSoundgroup played two long pieces, the first by Luciano Berio and the next by Krzsztof Penderecki. Berio’s sound worlds, free-standing spaces of their own, must be entered at their terms, and if this is done……yeah, BEAUTIFUL. Note to the SF Orchestral Establishment: performances of this music can make $$$$! Standout players from this group were John Ingle and Joshua Allen, with their saxophone POWER, and equally strong bassist Scott Walton, who drove the Penderecki piece ferociously. As for the Arkestra? Their Space Jazz music, so abstract and so warm, so swinging and so fiery. Disaster Amnesiac had not seen them since a Halloween show at Slim’s in the early 1990’s, and I wept tears of joy upon realizing that I was being treated to the amazing sounds of Sun Ra, his myth living in arrangements that he left behind, sparked by the loving mind of Marshall Allen and his big band cohorts. It strikes me that the Arkestra means a lot to a lot of people, and this shows when they play. The make people happy with their mixture of standard tunes, Ra originals, New Orleans funkiness and 21st Century space blasts. I just can’t sing their praises enough. Major kudos to Kirschner Concerts and their partners for putting on this great event! Space is indeed the Place! Comment from Ann O’Rourke, the editor of this blog: I saw Sun Ra live in 1968, during his first west coast tour, in San Francisco in a marijuana smoke haze. I was living in the Haight Ashbury, in my “hippie days”. I had never heard live jazz before. He was a fantastic composer, band leader, pianist, and Entertainer. I never forgot him. I couldn’t make it to this Arkestra performance, darn!! To read more of Mark’s reviews and comments, go to http://markpinoondrums.blogspot.com/ Very interesting!! Video of our 1-26-14 gig at Godwaffle Noise Pancakes!! 1-26-14 Earspray in Oakland - Godwaffle Noise Pancakes! Ann in Las Vegas-at a fun, fun, fun drummer performance!! 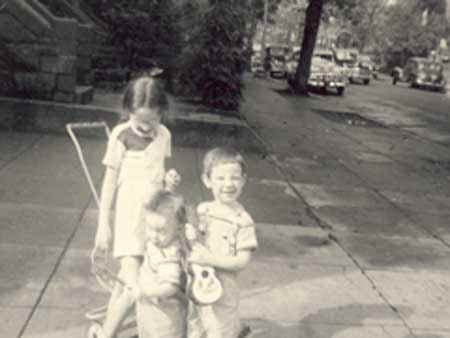 Ann’s First Band-her brothers stilll don’t listen to her!! Mark Pino the Wild Man!! Carlos, Ann and Mark – after the gig!! Ear Spray Music Blog at WordPress.com.